This photograph shows a class from Lane University in Lecompton, Kansas. The woman standing is Bertha Blinn Burkett and the first person on the left sitting is John Wesley Burkett. This school was founded in 1865 by Reverend Solomon Weaver, the first president of the university, and was named after U.S. Senator James H. Lane. In 1902 Lane University was united with Campbell University to form Campbell College. The parents of former president Dwight D. Eisenhower met at Lane as students. Today the building is a museum known as Lane University & Territorial Capital Museum. It is listed on the National Register of Historic Places. 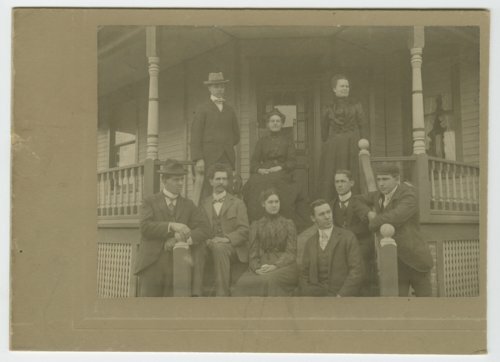 This photograph shows a class from Lane University in Lecompton, Kansas. The woman standing is Bertha Blinn Burkett and the first person on the left sitting is John Wesley Burkett. This school was founded in 1865 by Reverend Solomon Weaver, the first president of the university, and was named after U.S. Senator James H. Lane. In 1902 Lane University was united with Campbell University to form Campbell College. The parents of former president Dwight D. Eisenhower met at Lane as students. Today the building is a museum known as Lane University & Territorial Capital Museum. It is listed on the National Register of Historic Places.